Check out Canstruction, going on through this weekend at Barton Creek Mall. Competing teams, led by local architects, engineers and builders showcase their talents by designing and building giant sculptures made entirely of canned foods. At the close of the canstruction exhibition, all of the food used in the structures is donated to the Capital Area Food Bank of Texas. 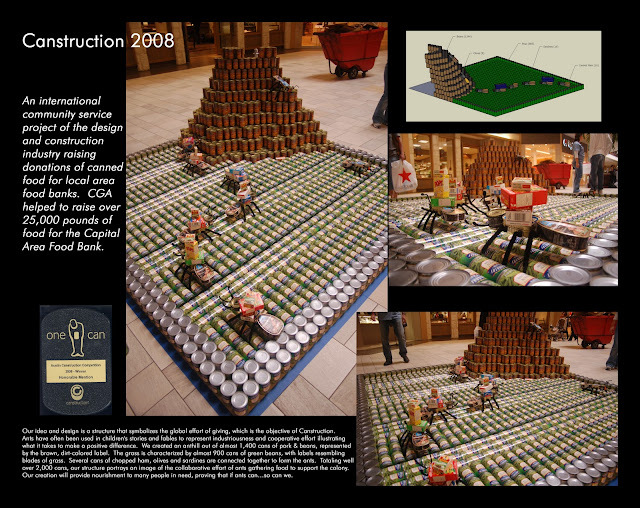 CGA participated in the first Austin Canstruction 2 years ago, with our structure 'Ants Can'. Our idea and design was a structure that symbolized the global effort of giving, which is the objective of Canstruction. Ants have often been used in children's stories and fables to represent industriousness and cooperative effort illustrating what it takes to make a positive difference. We created an anthill out of almost 1,400 cans of pork & beans, represented by the brown, dirt-colored label. The grass is characterized by almost 900 cans of green beans, with labels resembling blades of grass. Several cans of chopped ham, olives and sardines are connected together to form the ants. Totaling well over 2,000 cans, our structure portrays an image of the collaborative effort of ants gathering food to support the colony. Our creation will provide nourishment to many people in need, proving that if ants can…so can we. 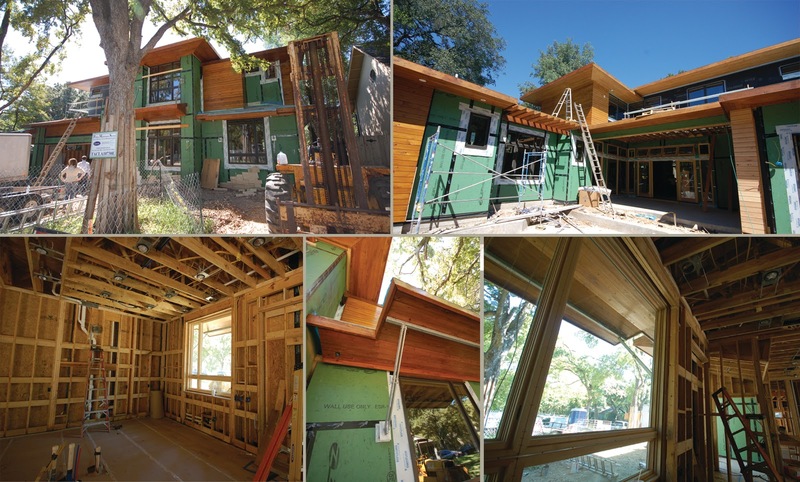 This 3,700 square foot custom green home in Tarrytown is under construction by Greenbelt Homes. The lot originally had a house on the property that had been neglected beyond economical repair and was deconstructed piece by piece with the lumber being recycled for wood flooring and other projects. Ninety-five percent of the materials are being recycled in some way: wood flooring, siding, furniture, art work, etc. 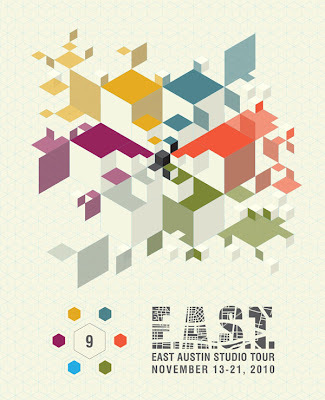 The East Austin Studio Tour is an opportunity for the community to get a behind-the-scenes look at working artists’ spaces and processes. Expand your art collection, learn more about an artist’s specific tools and techniques, watch a demonstration or simply talk with an artist about his or her work. Support your local economy and artists, see something new, and have fun! E.A.S.T. remains focused on the Artists & Studios. Studios, the places where artists create their work, will be open from 11:00 AM – 6:00 PM on the tour weekends: November 13 & 14 and 20 & 21. Check out Barkitecture this weekend in the 2nd Street District! Since its inception in 2005, Barkitecture has become an Austin favorite! Hosted by Animal Lovers of Austin, Inc. and the 2nd Street District, this architectural dog-centric fundraiser showcases doghouses created by some of Austin’s best and brightest architects, designers and builders. Click here for more information! CGA had an amazing time participating a few years ago. 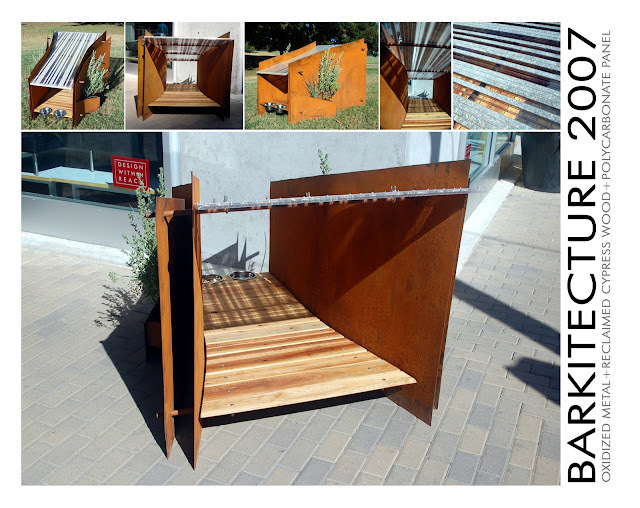 We worked together to design and build a contemporary, practical doghouse constructed of recycled oxidized metal, reclaimed cypress wood and donated polycarbonate panel from Gallina. The house was auctioned off and helped to raise $10,000 for non-profit, volunteer-run groups that help find homes for homeless animals! The documentary movie traces the work of late architect Samuel Mockbee and the radical design-build program known as the RURAL STUDIO. This film will be followed by a discussion with filmmaker Jack Sanders. Film will be shown in either the Goldsmith Lecture Hall 3.120, or in the Goldsmith Courtyard (weather permitting) on NOV 11 at 7:00pm. We always look forward to Halloween for our annual costume contest! This year, we had 4 creative participants...including a Blues Brother (Brian), a gypsy (Didem), a baked potato (Adam), and Kermit the Frog (Pam)! After all the votes were counted, 1st place went to the baked potato, with the Blues Brother a close 2nd!